Artist, sculpture, television and film actress Eleanor Boorman inherited most likely from her grandfather, wildlife artist Harry Pettit, Eleanor's natural talent was acknowledged early on: she was awarded the major sixth form art scholarship and later a scholarship from the prestigious The Royal Drawing School (or The Prince's Drawing School). 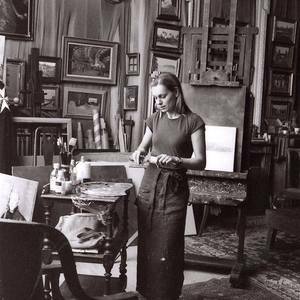 Whilst studying oil paintings at Charles H Cecil studios in Florence, Eleanor accepted patronage from the van Cutsem family in Norfolk, UK. Boorman’s work is constantly evolving and her inspiration has always come from nature. In 2000 and 2001 both Boorman, and the Cambridge Scholar, Sir Peter Jay, expressed separately their own discovery of a three-stage pattern of Western Society’s development. Jay in his book ‘The Wealth Of Man’, and Eleanor in her paintings exhibited at Archeus Fine Art, London. Boorman therefore continues her private study of science both social and natural; she notes that this is not unusual as science and art have a long symbiotic history. The area of quantum science and holographic art are both at the leading edge of modern study. Boorman’s work is housed in Royal collections as well as the Museum of the Order of St John and the celebrated Loyd collection. Boorman is a member of the Chelsea Arts Club and has a fiver year old daughter Rose, with 'Game of Thrones' Emmy and BAFTA awarded Actor Charles Dance. Eleanor Boorman lives in Kensington in Central London. Formally graduated at Durham University. Boorman was awarded the major sixth form art scholarship and later a scholarship from the prestigious The Royal Drawing School. Boorman has studied oil paintings at Charles H Cecil studios in Florence. and a number of European commissions in Scandinavia, France, and Switzerland. ◾ Celebrities including Albert Roux and Simon Cowell (2011). ◾ McMillan & Sons Fine Arts Ltd, London (2016).